I like to think that one of the gifts in the age to come will be enjoying lap time with my cat and maybe the company of other animals, but Sister Mary Martha will have none of that. No way, no how, the blogging sister says. (Motto: “Life is tough. Nuns are tougher.”) But even she acknowledges that many Christians think otherwise, and so they do. A recent article in Christianity Today, which I mentioned in my last post, offered a range of opinions. Jewish thought is just as ambiguous. (Look here and here, for examples.) Jewish commentators hint at a possible dividing line: The Aristotelian-leaning rabbis, such as the great medieval scholar Maimonides, are less inclined to see a place in heaven for animals. 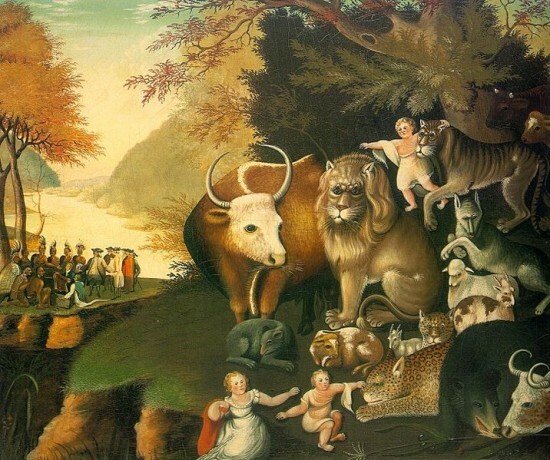 But the more mystically inclined, such as those who follow Kabbalah, think animals will be in heaven, in part because their rabbis taught that souls transmigrated—that human souls not ready for heaven enter the bodies of animals (ideally kosher ones, of course). But that’s another issue. Muslims, on the other hand, generally agree that the Koran teaches animals will be in paradise, part of the enjoyment God promises to his faithful ones. The Islamic concept of “Jannah,” or paradise, differs dramatically from the Christian, but I’m struck by the reasoning here. Animals, Muslims say, do what they were created to do by God, and so they “submit” to him–an important word, since that’s what the word “Islam” means. From that perspective, it makes that sense that God would admit them to paradise. That is, if I’m interpreting this teaching correctly, Muslims say God allows animals into heaven, rather than excludes them, precisely because they don’t have the choices we do, and he will be merciful. I don’t know if we’ll reunite with pets and other animals in heaven. I hope so: they would fit with the joy. Maybe the bigger question here is why I—why we—are so taken by this question. Why does this matter? Perhaps the way we think about animals offers clues to how we think about the creation and even the creator. I want my old cat in heaven because he was worth something, part of God’s good creation, and I like to think that God is generous even to cats and dogs, not to mention lambs and wolves who can enjoy a peaceful meal together. One last thought: If we embrace the idea of a God who cares for his creatures even into eternity, shouldn’t we care about them as well in the here and now? Previous Post Is this cat in heaven?